January State of Connecticut approves $4 million for cleanup of Rochford Field and Peter Villano (formerly Mill Rock) Park. July DEEP grants Olin’s request to discontinue ground-water monitoring of residential properties as sampling results indicate the groundwater meets groundwater protection criteria. April Public meeting held on the remedial action plans for Rochford Field and Mill Rock Park. Connecticut Bond Commission approved a $5 million dollar grant for the rehabilitation and renovation of the Newhall Community Center to act as a business incubator. May Block C - Restoration nearly completed. Two properties (1067 and 1071 Winchester Street) were purchased by Hamden Economic Development Corporation and are being deconstructed. Block F - Waste fill was excavated from all 22 properties on the block. Restoration is well underway. Block T - North side of Augur Street has had waste removed and restoration is ongoing, followed by the east side of Remmington Street. Block E - Waste fill nearing completion on all 15 properties with fill on the block. Backfill occurring simultaneously. Restoration will be on-going in late May. Block P - Tree cutting & preparation for excavation of waste fill will be underway by late May. Block Q - Final block. Tree cutting/preparation to start near end of May/early June. October All waste fill removed, restoration of properties completed –remediation of residential properties within consent order boundary at 100%. Construction equipment removed from staging area on Morse Street. Two homes on Winchester Avenue de-constructed, building materials recycled for other uses in New Haven area. Semi-annual inspection of new plantings (trees & shrubs) is underway. Town of Hamden removed sediment from stormwater outfall at corner of Newhall and Mill Rock Street to address neighborhood flooding during heavy rain. January Hamden Economic Development Corporation continued to evaluate the structural conditions of homes to conduct a cost benefit evaluation repairing vs. removal of these homes. By the end of January 60 homes have been inspected, 58 of these had appraisals completed and cost estimates for repair were ready for about one third, 22 homes. Outreach work continues with property owners in Blocks J and H. By the end of January, five of the nine property owners who had been issued orders by the DEP Commissioner in December had agreed to proceed with cleanup. February The Hamden Economic Development Corporation (HEDC) announces a partnership with Gateway Community College, the Regional Workforce Alliance, The CT. Department of Labor and Urbanminers to offer job training for unemployed residents from the Newhall/Highwood and Hamden community in the skill areas related to deconstruction and recycling. Trainees will use these skills to remove some structurally damaged homes participating in the cleanup project. The Town of Hamden and the Hamden Economic Development Corporation (HEDC) will hold a free Housing Fair for Hamden residents including those in the Newhall/Highwood neighborhood on February 28th from 3-7P.M at the M.L. Keefe Center. The purpose of the Housing Fair will be to provide information on services, resources and product information related to housing opportunities, energy efficiency programs, mortgages and programs for structural or other repairs, and updated information on the Newhall remediation program. All waste fill was removed from properties on Block H to the 4’ zone. June Block H –Cleanup is done on the block and restoration is 98% complete. Block J – 100% participation. Cleanup is done, restoration is 80% completed. Removal of waste fill to the 4’ zone underway on Block L.
Block K – 100% participation. Preparation for cleanup (surveying, tree and fence removal) started in late June. 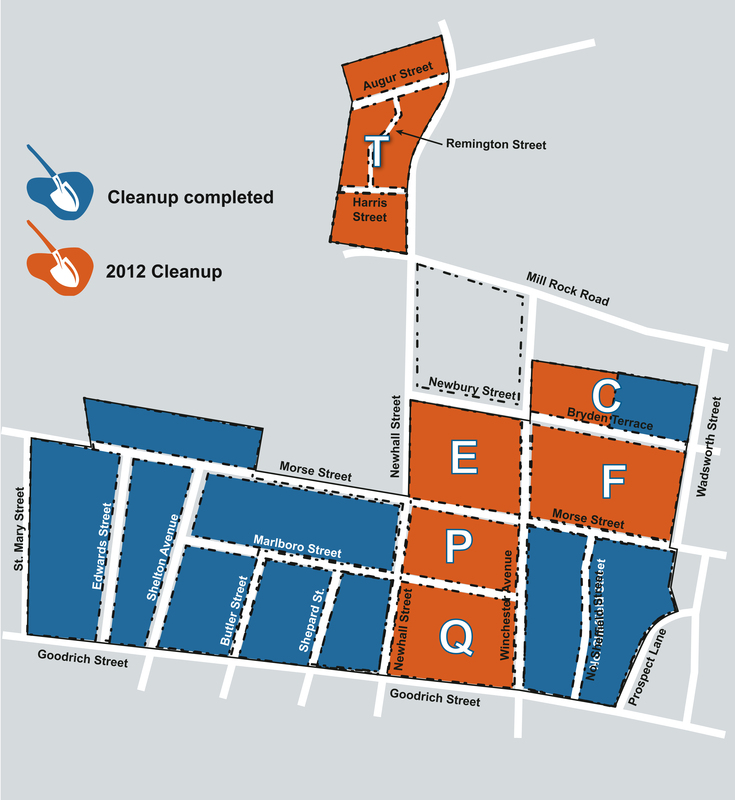 Block A – Cleanup to start in late July/early August month. July Outreach to property owners to obtain access for 2012 cleanup is underway. 95% of property owners scheduled for cleanup in 2012 have signed Access Agreements allowing Olin to conduct Property Inventories. Jan - Feb DEP approves or conditionally approves 9 construction work plans submitted by Olin for cleanup of the residential properties and approves Olin’s report on the additional investigation of 22 properties. Read approval letters and view construction work plans. Olin sends letter to DEP Bureau of Materials Management and Compliance Assistance regarding waste fill sampling results and whether waste fill at the site can be disposed at the Tire Pond. Olin sends letter to Town of Hamden requesting a waiver of Town permits for the cleanup project. DEP staff makes calls and visits to property owners to help explain the cleanup process, answer questions, and encourage participation in the cleanup. Olin representatives continue meeting with property owners in Blocks N, R and S and Blocks H and J about the cleanup. As of the end of February, 20 of 24 property owners in Blocks N, R, and S have signed the access and restoration agreements to have their properties cleaned up. March DEP staff meets with representatives of Quinnipiack Valley Health District to brief local health officials on upcoming cleanup in residential areas. DEP staff continues to make calls and visits to property owners to help explain the cleanup process, answer questions, and encourage participation in the cleanup. DEP staff provides a brief project overview and update to members of Hamden’s Legislative Council. DEP and the Town of Hamden send joint letter to Southern Connecticut Gas Company requesting coordination assistance on construction project. Olin is coordinating with the Hamden Police Department on appropriate truck routes through the Town for transportation and disposal of the waste fill. DEP Bureau of Materials Management and Compliance Assistance agrees with Olin’s sampling approach and recommends additional sampling of waste fill to ensure that hazardous waste is not disposed at the Tire Pond. DEP Remediation Division approves Olin’s plan for additional sampling of waste fill for the purposes of the Consent Order. The Town of Hamden grants Olin a waiver from applying for planning and zoning permits, but still requires submittal of building permits, inspections and certificates of occupancy for removal and replacement of permanent features on residential properties (i.e., decks). June Olin submits proposed traffic routes to be used by trucks during the remediation project and a traffic control plan to the Hamden Police Department for approval. 21 out of 24 property owners in Blocks N, R, and S with waste fill have granted Olin permission to perform the cleanup of their properties. DEP issues orders to 3 property owners in Blocks N, R, and S with waste fill who have refused Olin access to perform the cleanup. July State Bond Commission approves $5 million for the assessment, repair or purchase of the most severely damaged homes in the Newhall remediation project area. Community Liaison Richard Pearce of Evolution Enterprises LLC is hired by the Hamden Economic Development Corporation to provide outreach, education and facilitation services during cleanup. DEP approves Olin's request for borrow sources for fill and topsoil to be used in the cleanup project. Olin's contractor, Sevenson Environmental Services, begins groundwork for launching cleanup in mid-August. This includes property boundary surveys, hiring local contractors to do property restoration work and getting permission to set up a construction staging area behind the former Community Center located at the corner of Newhall and Morse Streets. Hamden Town Council unanimously voted to approve the access agreement between the Town and Olin to allow Olin's contractor, Sevenson Environmental Services, to park heavy equipment and stockpile materials needed for the cleanup and restoration of the neighborhood at a staging area behind the former Community Center building at the corner of Newhall and Morse Streets. DEP approves a relocation assistance policy manual for residents who are relocated during cleanup. A summary ( in webpage format) of the manual is provided residents. August The first trucks carrying waste fill out of the Newhall neighborhood began to roll the week of August 23, starting at the southeast corner of Morse and No. Sheffield Streets. Once work is complete on the south side of Morse Street, cleanup crews will move to Prospect Lane. See map below for the location of blocks (N, R & S) where cleanup will occur in 2010. In the first four days of the cleanup project, some 50 truckloads of waste fill was removed from the neighborhood. 100% of Phase 1 property owners have signed access agreements allowing cleanup on their properties. During cleanup of properties on Morse Street, contractors found waste fill extending into an adjacent property that was not initially included in the cleanup program. Access to clean up this property was immediately obtained, bringing the total number of properties in the Phase 1 cleanup to 25. Staging location for equipment and materials was set up behind the former Newhall Community Center. The contractor's construction trailer is located behind this building. Plans for the DEP to relocate its Community Office from the Keefe Center to the former Hamden Middle School in September are delayed. The Town of Hamden approves new zoning regulations that create a Local Design District in the Newhall neighborhood as well as Newhall Center Special District for town properties that include the former Hamden Middle School and town parks. September Excavation of waste fill on Block N began on September 28, 2010 and is expected to continue through the first week of October. During the cleanup process on Block S, the excavation contractor discovered a minor amount of waste fill extending onto one property not originally identified as having waste fill. The waste fill was removed with the property owners consent. Richard Pearce, Community Liaison for the project has been actively contacting property owners in Blocks H and J that have yet to sign access agreements to allow the cleanup to proceed on their property. There are only a few weeks remaining for property owners on Blocks H and J to sign access agreements to avoid being issued an Administrative Order by the DEP. Property owners on Blocks H & J that have not yet signed access agreements are encouraged to contact DEP staff promptly to discuss the cleanup process. Mr. Pearce has been meeting with property owners to discuss preliminary structural assessments. Site restoration on Block S and R was almost completed. Remaining work to be done consisted of minor follow-up items, e.g. fence staining, planting of shrubs, etc. Six additional properties participated in the cleanup project either to remove minor amounts of fill that were not previously discovered during the 2004-05 testing or to grant access to construction crew of equipment to enable easier cleanup of adjacent properties. Richard Pearce, Community Liaison for the project continued to meet with property owners in Blocks H and J to encourage their participation in the cleanup project and to discuss preliminary structural assessments. November Construction work for the season ended in mid-November. The construction field office located on Morse Street behind the former Community Center Building on Newhall Street was shut down and removed from the site. Cleanup is expected resume in April 2011. December DEP issues orders to 9 property owners in Blocks J & H with waste fill who have refused Olin access to perform the cleanup. July Preparations to start cleanup in the Newhall neighborhood of Hamden, CT are underway. Representatives of Olin Corporation are currently meeting with property owners in the blocks where cleanup will begin to discuss cleanup plans for individual properties and to obtain access to remove waste fill and restore these properties once cleanup is done. A "Draft Temporary Relocation Assistance Policy Manual" is submitted to DEP by Olin. (See Residential Documents section). September The schedule to start cleanup has been revised. Work will begin in Spring 2010. Representatives of Olin Corporation continue to meet with property owners in the blocks where cleanup will begin first to discuss cleanup and restoration plans for individual properties. Property owners must sign an access agreement to allow Olin to conduct the cleanup and restoration. A Final Additional Investigation Report for 23 properties that needed further investigation to evaluate the presence or absence of fill materials is submitted to DEP by Olin. February DEP begins holding block meetings to talk with property owners about how cleanup will be done. Meetings continue until April. Olin evaluates DEP chemical criteria protocol for acceptance of fill materials removed from non-public properties for placement at Tire Pond Landfill. March Newhall Neighborhood Revitalization Plan developed for the Town of Hamden by the Regional Growth Partnership consultant team is completed. Regional Water Authority in collaboration with Town of Hamden submits a report to DEP that proposed a change of Ground Water Quality Classification from Class GAA to GB in the Newhall neighborhood. March Third community meeting is held to develop a plan to redevelop the former Hamden Middle School site. July Reuse plan for former Hamden Middle School site is completed. Consultant team is asked to expand its planning to include entire Newhall neighborhood. August New Hamden Middle School opens on Dixwell Avenue, leaving the former middle school on Newhall Street vacant. November Governor signs legislation authorizing $5 million to pay for structural damages to homes. January DEP staff work until August developing a Draft Remedy Selection (cleanup) Plan. August DEP Commissioner Gina McCarthy presents Draft Remedy Selection Plan at a public meeting attended by 200 people. September DEP holds an open house session with property owners to discuss proposed Remedy Selection Plan. October Regional Growth Partnership is hired by the Town of Hamden to lead a consultant team to develop a master reuse plan for the former Hamden Middle School site on Newhall St. The consultant holds the first of three community meetings. Work begins by DEP staff to address major concerns residents have with draft Remedy Selection Plan (1) find alternative feasible site to place fill removed from non-public (mostly residential) properties rather than place at former Hamden Middle School and (2) find alternative other than ELURS (environmental land use restriction) to note presence of contamination on properties in Newhall neighborhood. These tasks will take one year to complete. December The second community meeting is held to develop a plan for the entire Hamden Middle School site that provides redevelopment options for the neighborhood and the Town of Hamden. January According to its Work Plan, Olin does a second round of testing at residential properties based on its findings from testing done during the summer. February DEP’s contractor, Loureiro Engineering Associates, Inc., begins testing at residential properties outside the boundary of the original Consent Order to determine if contamination extends beyond the boundary of the Consent Order. March Olin submits a final report of its investigation of contamination of residential properties within the Newhall project area. Olin inspected and/or tested 289 properties, installed 29 new monitoring wells and had 839 soil samples tested for contaminants. DEP review begins immediately. The Regional Water Authority submits its final report on investigation of the Hamden Middle School part of the site. April The final report for investigation of Rochford Field, Mill Rock Park and the Winchester Avenue Sewer Pump Station is submitted to DEP. May A public meeting is held to discuss Olin’s final report and identified cleanup alternatives for residential properties. June A public meeting is held to discuss final reports and identified cleanup alternatives for town properties (Hamden Middle School, Rochford Field, Mill Rock Park and the Winchester Avenue Sewer Pump Station). December A public meeting is held to discuss findings of DEP's investigation of properties outside the Consent Order boundary. February DEP holds open house for public to ask questions, make comments on Olin’s proposed Work Plan to investigate contamination at residential properties. Sampling equipment to be used in testing is on display. April DEP approves Olin’s Work Plan to investigate contamination at residential properties, with additional conditions. Olin seeks written access agreements to test 302 properties within Consent Order area (over 90% of properties grant permission by September). Regional Water Authority presents Work Plan at a public meeting to investigate contamination at Hamden Middle School. May DEP holds open house for public to ask questions, make comments on Work Plan to investigate contamination at Hamden Middle School. Testing begins at residential properties and continues through September. June Health forum is held on what living on a landfill means to residents. Program is a collaborative effort of the State Department of Public Health, the Department of Environmental Protection and the Newhall Coalition. Sixteen people attending program were tested for elevated levels of lead. None tested had blood levels exceeding public health standards. July Town of Hamden presents Work Plan to investigate contamination at Rochford Field, Mill Rock Park and the Winchester Avenue Sewer Pump Station at a public meeting. DEP approves Regional Water Authority’s Work Plan to investigate contamination at Hamden Middle School, with additional conditions. August Monitoring wells are installed; soil testing conducted on grounds of Hamden Middle School. DEP begins discussions with Newhall residents about forming an advisory committee to assist the Department in evaluating cleanup options. September DEP holds open house meeting on Town’s Work Plan to investigate contamination at Rochford Field, Mill Rock Park and the Winchester Avenue Sewer Pump Station. October DEP approves the Town of Hamden’s Work Plan to investigate contamination at Rochford Field, Mill Rock Park and the Winchester Avenue Sewer Pump Station, with additional conditions. November The Newhall Advisory Committee, a stakeholders group comprised of residents, elected and town officials, area business and church representatives is formed. The majority of members live in the area affected by the consent order. Olin presents its preliminary findings of its investigation of residential properties at a public meeting. December The Newhall Advisory Committee holds its first meeting and sets a regular monthly meeting schedule for the coming year. Group holds monthly meetings until June 2006. February Consent Order signed by all parties, town council needed to approve. Reaction mixed. Residents accuse town of having no vision for neighborhood. Residents dislike: 1. disposal of waste from neighborhood on middle school property; 2. DEP is serving two ends - both as an enforcement agency and as a funding agency; 3. moving middle school from Newhall neighborhood. April CAP (Community Advisory Panel) is organized by Olin. Group meets through June 2003. October RWA presents results of soil & groundwater investigation at HMS; Town presents results of tests at Mill Rock Park, Rochford Field at public meeting. DEP test soils along streets in Bryden Terrace area. Teachers' Union seeks second opinion on indoor air data. Yale evaluates report. July DEP orders Town of Hamden, Regional Water Authority, State Board of Education, and Olin Corporation to clean polluted soil. All parties appeal order. Patches of exposed soil at Rochford Field are covered over by the Town of Hamden at direction of DEP and the state Department of Public Health. Rochford Field is reopened. Olin offers to establish CAP (Community Advisory Panel). November Phase I Investigation of Hamden Middle School for planned school expansion reports historic landfill with waste. Report confirms waste and soil contamination. December Department of Environmental Protection directs town to sample surface soil around Hamden Middle School buildings. Contamination identified in surface soils.